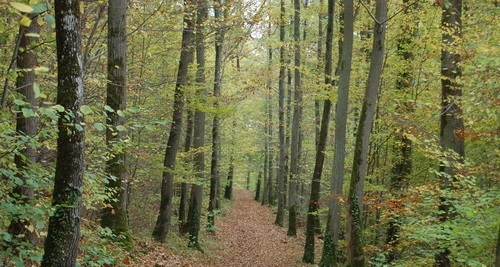 A project in the region of Ile-de-France received funds from EAFRD to develop a sustainable management of the forest and help develop links among the different actors within the wood sector. A Société Civile Immobilière (real estate company) has purchased forest plots for a total of 238.7 ha. These are subject to a valid simple management plan (MTP). The property consists of mixed stands of trees and copse of oak, chestnut, ash and wild cherry tree. Wishing to promote its recent acquisition and aware of the merits of sustainable management of forests, the owner wanted to set up a forest service in order to achieve a planned timber harvesting. Mobilisation of wood involves the supply of the forest-based sector. Support for the forest service contributes to the sustainable management of forests and activity in the area. This project aimed to improve access in and out of the woods as part of the planned cuts in the MTP. With the support of a forester, the owner started a project of i) planting 4 hectares of chestnut and ash, ii) building a protection fence against game and iii) constructing a forest road in two tranches: 3.6 km of forest road with 3.2 km of forest tracks accompanied by remediation and car rollover. The expected impact of these improvements in the forest will be assessed within the next 5 years (change in section, improved canopy). The service implemented for a next harvest also facilitates the ongoing management of the forest (work designation cuts, maintenance of regeneration plots). This project contributes to better mobilisation of wood by the access of logging trucks nearer to the resource (cost savings mobilisation) and guarantees future quality resource for the industry. This dynamic management can also lead to better mobilisation of neighbouring landowners, in order to value their heritage.